All Christians of the different Orthodox Churches (the early churches that originally began by a disciples of Jesus, such as St. Peter, St. John, St Mark etc.) All the old churches before we pray we often do the sign of the cross. Many Protestant are often afraid of this, I am not sure why, I think they may think it is a form of superstition, I am not sure why. I remember once when I started to sign myself with the cross one day, I felt the blessing of the whole crucifixion on me while doing it. Believe me that is powerful, words of course can’t describe such an experience as that. I found my hand was very heavy and could only sign myself extremely slowly with total reverence of the blessings that came from Jesus’s crucifixion. I believe God was teaching me by signing myself with the cross, the slower I did it with true reverence the better it is for me and of course the more powerful it is when I do it that way. I do not know how the custom got started, but far as I am concern since all the Orthodox Churches do it, it must have started with the first century Christians. How we sign ourselves with the cross? We usually use our right hand. With the three middle fingers, we place it first on our forehead and say ‘In the name of the Father’ and then we place our fingers down just above our stomachs, bit below our chest, and while doing this we say ‘and the Son’. Then Catholics would then place their fingers on the left shoulder and then to the right shoulder, some churches do it the other way around and while we are doing this we say ‘and in the Holy Spirit.’ Doing that we keep the membrane of what Jesus did for us on the cross. By doing this before every prayer the membrane is forever with us and we are also giving witness to it. Some people like myself when we done that we then put our fingers on our heart. And say ‘Amen’ by doing this we are saying we are sinners, I repent of all my sins, please forgive me, by the merits of all that Jesus suffered for me on the cross. We do this at the beginning of most prayers and saying the Rosary is no exception. 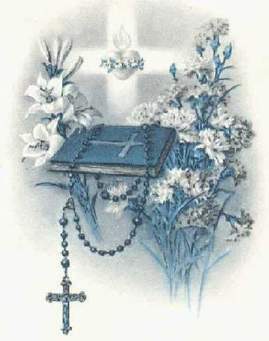 After signing ourselves with the cross we then kiss the small crucifixion figure on our Rosary beads. When I told this to my Protestant friend, when she first was learning to say the Rosary she was fearful. So I tried to explain why we do it. Since we are not physical so to speak at the foot of the cross and we can’t personally kiss the foot of Jesus we do the next best thing and that is kiss the crucifix as if we are kissing His feet. It still worried her, so then I tried to explain it this way, when I was in my very early twenties I was filled with the Holy Spirit and I couldn’t help praising Him and I wanted to give Him a bear hug and kiss Him passionately, but since I couldn’t do this I told Him I am going to kiss and hug my pillow as if it is Him and would He accept it as if I am really hugging and kissing Him. Two years after that experience God the Father appeared to me as light and was very hot and to keep the story very short, He hug and place His face on my face on the right side. I knew in my heart He was responding to the time when I hug and kissed my pillow as if I was kissing and hugging Him. He was basically saying that He not only accepted it, He blessed it tremendously. Nothing we do for God out of love is ever wasted. And we must always remember we are to come to God as a child not as the stuffy old man that supposed to have died when we were born again. To be a child of God is not to be childish but to have the pure and simple faith of a child. They use their imagination, stuffy old adults are not capable of doing this. Being a stuffy old man are too proud to be childlike. Basically they are not able to let themselves go and be free to love in God’s Spirit, which gives us so much joy. Now that I have explained this, in my next article I will begin to explain how we say the Rosary.